Plaza gets a lot of opportunities to service Mack trucks and their camelback and walking beam suspensions. We routinely not only do re-bushings but also replace trunnion stands, the trunnion shaft, and any frame-rail cross members necessary to mount a new trunnion stand. We diagnose bushing problems without taking the suspension apart. 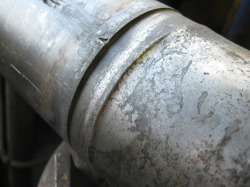 We look for the tell-tale signs of worn center bushings. A cracked trunnion cap indicates that excessive side-to-side wear may have popped the trunnion nut and allowed the spindle to contact the cap. 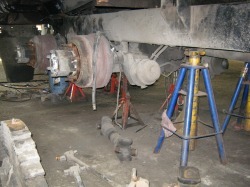 Worn trunnion bushings will produce a gap between the trunnion and the bushing. To test this we place a jack under the frame and raise it. Then we place a jack under the trunnion assembly and push the assembly up to look for free movement of ¼ inch or more. This test will indicate how much, if any, the bushing is worn. Don't be stingy with the grease. One expensive component of a camelback suspension is the trunnion shaft which is sometimes referred to as the trunnion tube or spindle. Whatever you like to call it, it is not indestructible. In order to protect the shaft, it is important to regularly grease the trunnion assembly and inspect the insulator pads for wear. Although they are postioned far from the trunnion shaft, they could be the cause of wear on the shaft. 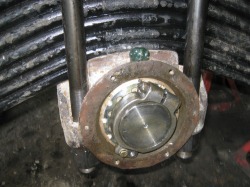 Worn insulator pads will cause a loosening of the insulator box which in turn allows the entire spring and trunnion assembly to wobble around the shaft. Without adequate grease this wear will deform the shaft ultimately requiring the replacement of the trunnion shaft. If you are not sure how to grease and maintain your Mack suspension, please give us a call and avoid a more costly problem. To insure that the grease finds its way to the bottom half of the bushing, it is usually necessary to lift the rear of the vehicle and lift the load from the suspension. The final test for a bushing problem is to remove the trunnion cap and look for shavings and lack of grease. Shavings might indicate a more severe problem. Picture at bottom shows what can happen when a problem is not caught soon enough. The bushing is worn through allowing the hard metal of the trunnion assembly to rub on the trunnion shaft. 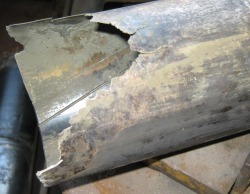 Picture below shows the result of trunnion assembly rubbing directly on trunnion shaft. Threads are to the right of picture. Ridge at left caused by inside of trunnion assembly. Shiney surface caused by metal to metal friction.